So the 50th Anniversary of Doctor Who is upon us. It really is impressive that a mere TV show has lasted that long. And while strictly speaking it hasn’t done so purely as a TV show, spending 15 years off-screen, it’s not like Doctor Who didn’t exist during that time. 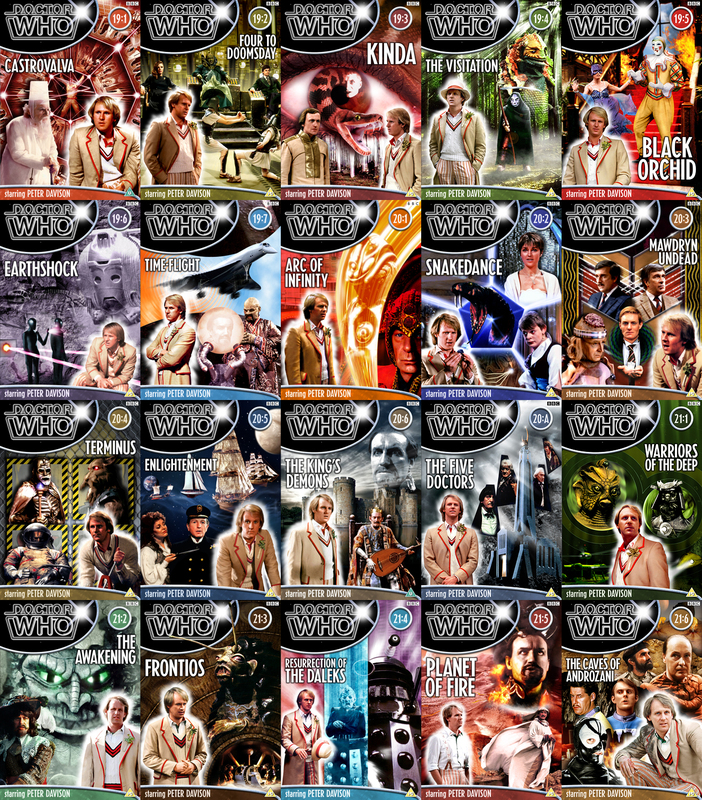 There were independently produced video episodes, audio-only adventures, Doctor Who Magazine and its continuously running comic strip and years’ worth of books of newly published stories. So on whatever basis you consider the programme to exist, it was there. And these weren’t obscure fan-only output, they were on sale in high street shops for anyone with an imagination to be captivated by. I’m not sure even Star Trek or Star Wars could boast quite the same level of continuity (though I won’t begrudge them their own half-century celebrations in 2016 and 2027). The countdown to 50 continues with the last of the Second Doctor releases: The Ice Warriors — at least it would have been if they hadn’t only gone and found two more previously missing stories! So yes, that would have been it for the Troughton era except we now have The Enemy of the World and (most of) The Web of Fear back in the archive, and soon on our shelves. Hurrah! I plan to do the cover for the former shortly, alongside finishing off the last few re-releases that need their covers amending, and the latter will follow, probably early next year nearer its DVD release. So here’s the Second Doctor collection as it currently stands. The countdown to 50 continues with new covers for Third Doctor stories Spearhead from Space, The Ambassadors of Death and The Mind of Evil. Click here to download the covers from Velvet Jacket, and read notes about their creation here. I’ve also uploaded a refreshed Inferno cover for the recent re-release. The illustration has been very slightly tweaked but not redesigned, and the back has been updated with the new extras. 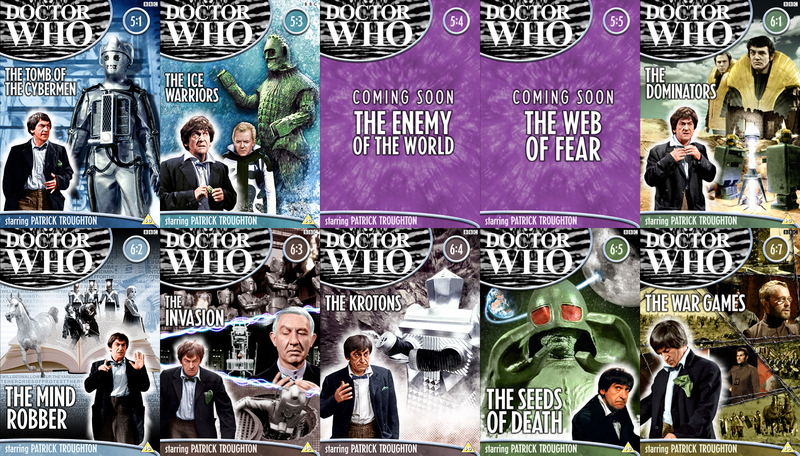 That leaves two Third Doctor re-releases that need updated covers: The Claws of Axos and The Green Death. The former I only plan to change the pics of the Doctor and the Master for better quality ones, while the latter I’d like to replace the miner with Stevens if I can find a workable shot of him. 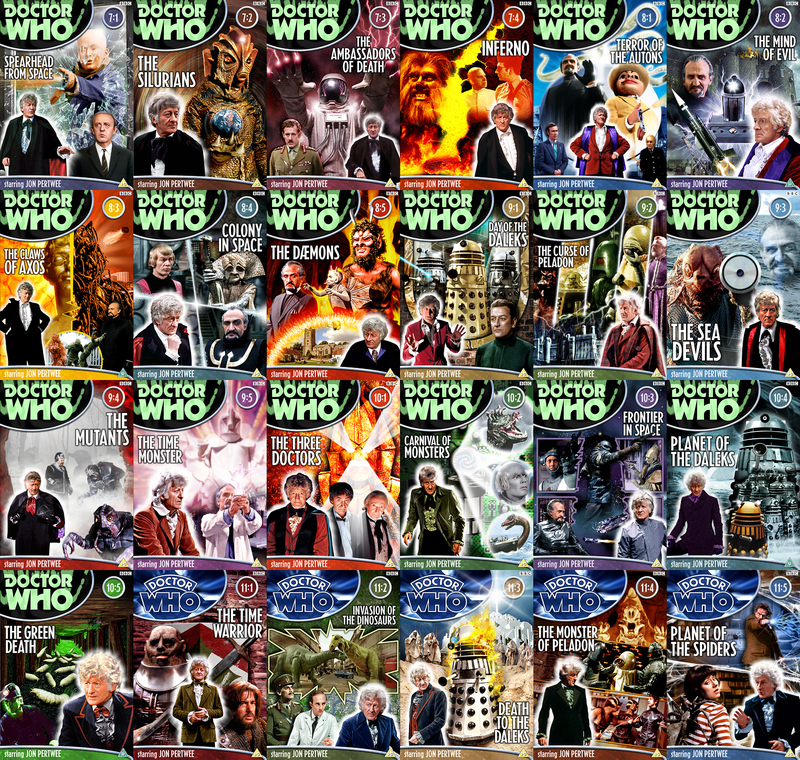 I’m hoping to get those done shortly and then the Jon Pertwee era will be complete as I think the rest are looking good. 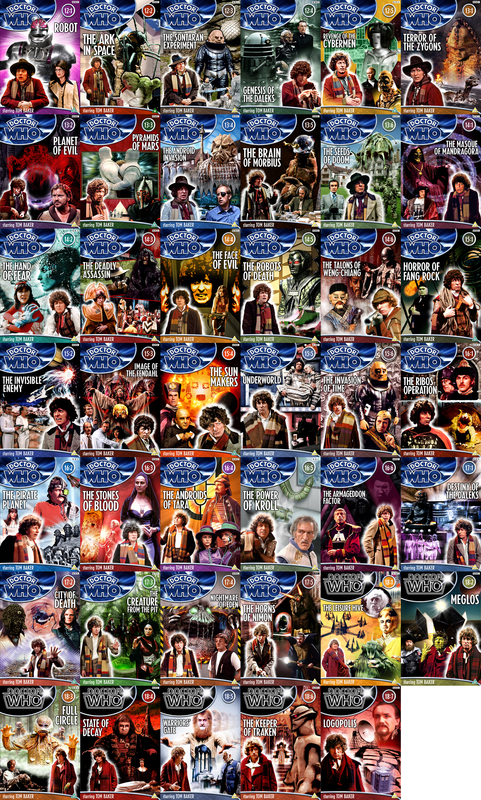 The countdown to 50 continues with new covers for Fourth Doctor stories Terror of the Zygons, The Face of Evil and Nightmare of Eden. The Tom Baker era is now complete on DVD, at long last, but I do have just one more cover to do. The Ark in Space will be getting redone shortly, I’ve been prioritising the new releases for this update. I don’t plan to make any design changes, however, just update the photos to improve the quality. The main change may be a different shot of the Doctor, depending on what I can find. The only other tweak I have in mind to make once the range is complete is to The Leisure Hive, where I know I have a better quality photo of the Doctor to drop in. The countdown to 50 continues with my updates for the re-releases of The Visitation and The Caves of Androzani. While the Peter Davison era has essentially been complete for a while, I’ve known the Androzani cover has needed revising for a long while (see the link above for some reasons why it has taken so long), and with this year’s re-release of The Visitation we’re only now truly up to date (unless they re-visit any more). Again there’s just one cover I may look to tweak once all the DVDs are out, namely Earthshock, where I think the shot of the Doctor could be improved. The countdown to 50 continues with my update for the re-release of Vengeance on Varos. I had thought my covers for the Colin Baker era complete, then they went and revisited this one. But as I wasn’t totally happy with the original I was glad to get the chance to rework it. 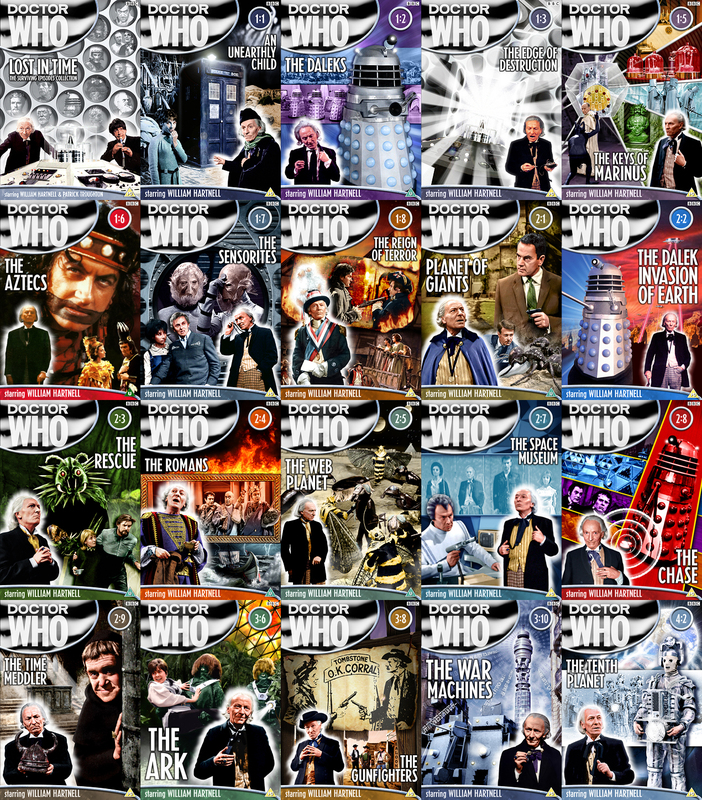 I think this collection is now up to scratch, with only The Two Doctors worth a tweak one day as I’m sure I’ve seen higher quality versions of both Doctor images since I made it. Of course, if the BBC want to re-release it, that’d be the perfect excuse.